Shumaila daughter of George Masih and Bushra Bibi is a resident of Dera Easa Nagar, Sargodha and is 21 years old. She is the youngest child in the family of four children. CPIR mobilizer identified her during aptitude test sessions in her area. She is very confident and was willing to learn a new skill to support her family. 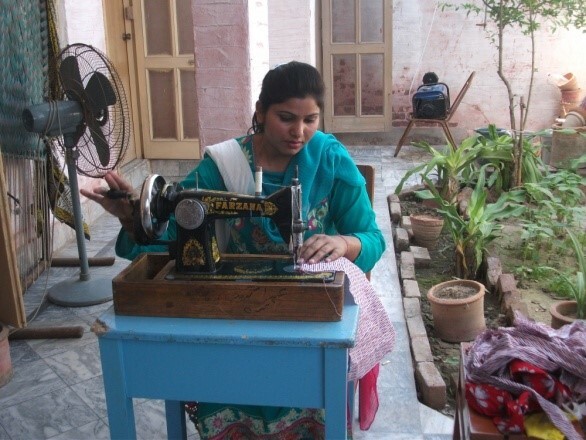 She started her one year training on sewing and stitching in St. Mary’s Skill Center, Rehmat Park Sargodha. During her training period she was always an outstanding student and favorite of her teacher. She very dedicatedly learnt all the steps. Immediately after the training, she started to get work from her relatives and neighbors. She is now earning approx. 6,000 – 8,000 PKR a month. “I am proud of my daughter and thankful to God and Caritas” said her father.